The Wizard of Oz Musical is on it's way to Australia opening at Melbourne's Regent Theatre in May 2018. Great news theatre goers. Andrew Lloyd Webber's musical rendition of the Wizard of Oz is on it's way to Australia and will open at Melbourne's Regent Theatre in May 2018. Take a journey to the land of Oz with Dorothy and Toto as they find themselves far far away from their home town of Kansas. Follow the yellow brick road all the way to the Emerald City to find the Wizard, meeting the much loved Scarecrow, Tin Man and Cowardly Lion along the way. On route, the newly acquainted friends must avoid the Wicked Witch of the West and her evil winged monkeys. Are you ready to take this magnificent, enchanting on-stage journey with them? Andrew Lloyd Webber's production of The Wizard of Oz first premiered at The London Palladium Theatre in March 2011. 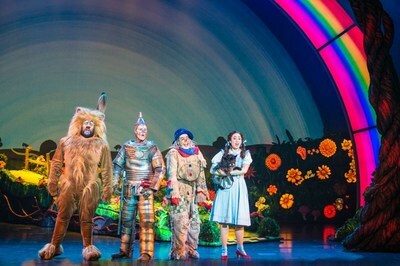 After a successful West End season, The Wizard of Oz musical opened in Toronto, December 2012 and then embarked on a US tour from September 2013. Tickets are now on sale in what promises to be a dazzling revision of the all-time classic tale.